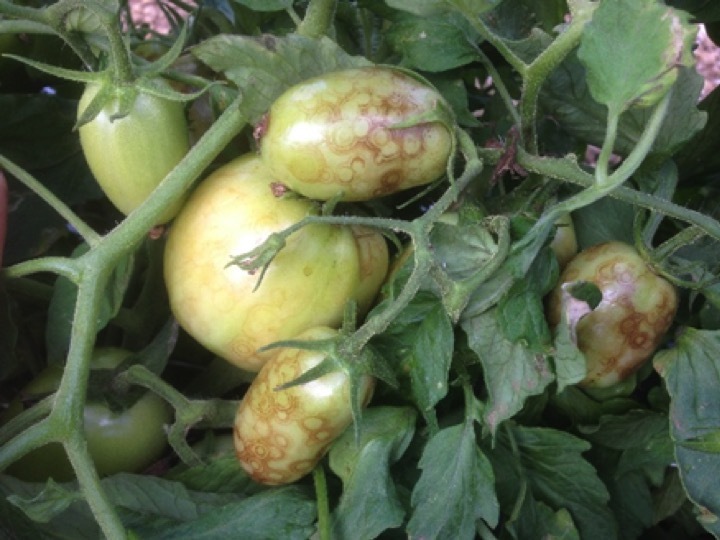 There is a new virus to be on the outlook for: Tomato Chlorotic Spot Virus (TCSV). 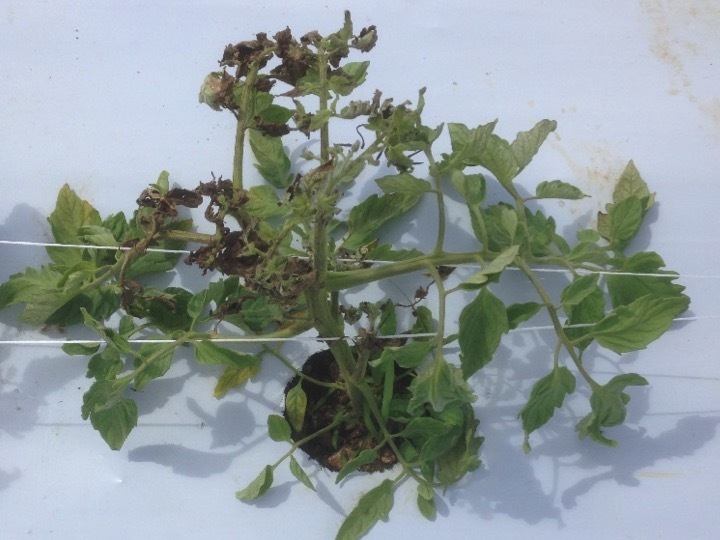 While it has primarily been affecting tomatoes in south Florida, it has the potential to be moved elsewhere, it has a wide host range, and it can be very destructive. 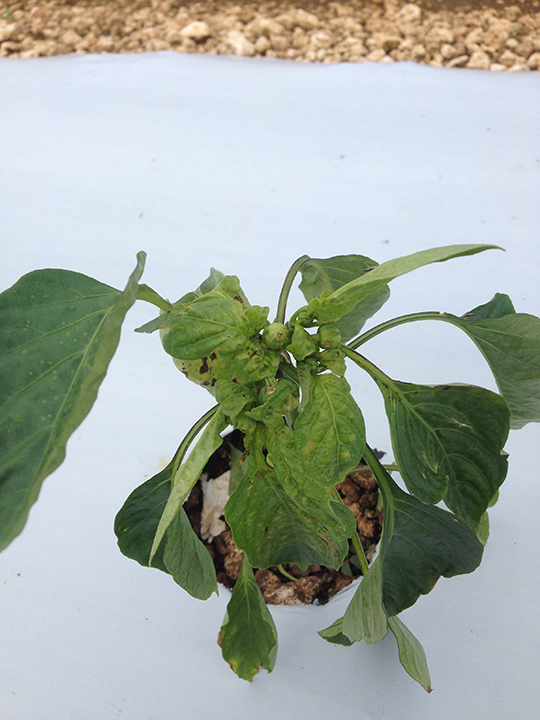 Florida growers have sustained great losses, thus this is an important disease to be aware of. 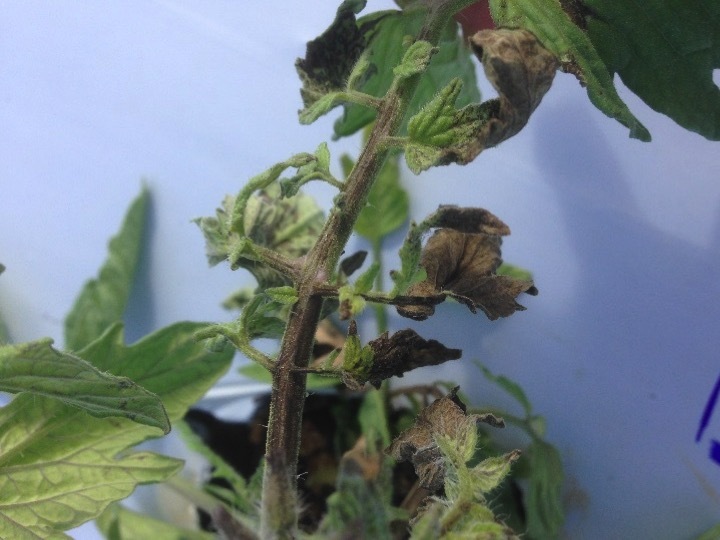 TCSV was confirmed on tomato in a high tunnel in Ohio in 2013 and in a field planting on Long Island, New York, in 2016, documenting its ability to affect crops outside of Florida. 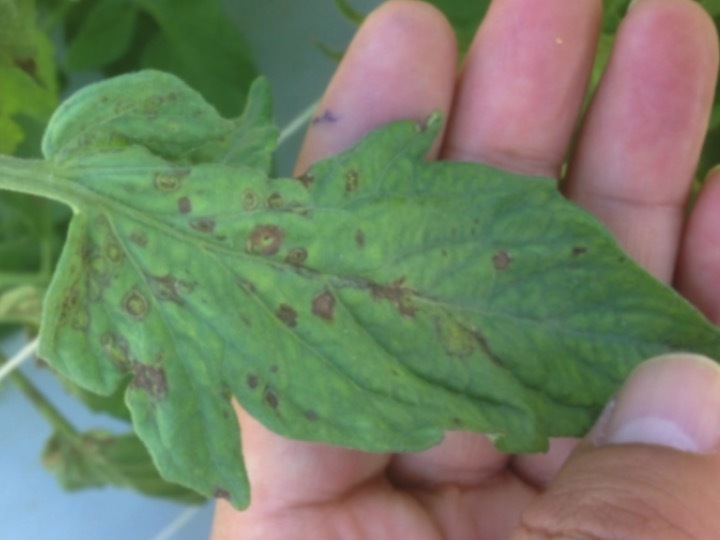 TCSV is related to Tomato Spotted Wilt Virus (TSWV) and Impatiens necrotic spot virus (INSV), which already occur widely in the USA. All are tospoviruses and are spread by thrips. 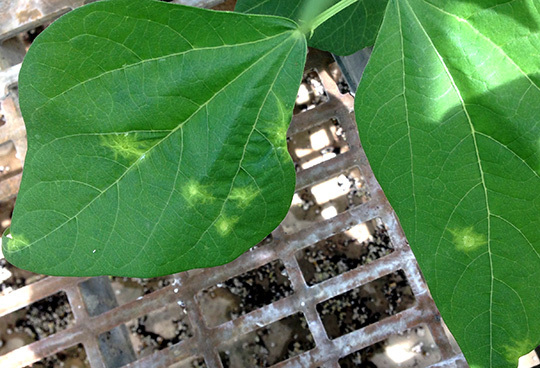 Groundnut ring spot virus (GRSV) is another new tospovirus. All three viruses occur in Florida; TCSV is now the dominant one. 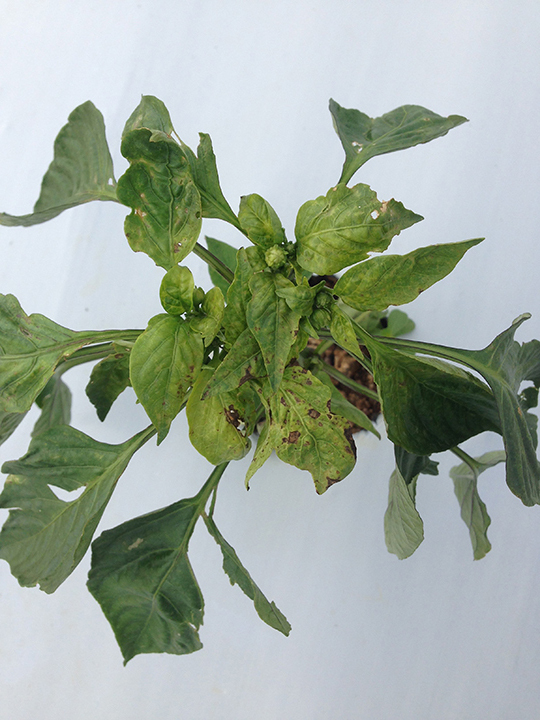 Western flower thrips have been increasing in occurrence in parts of the northeastern USA due to insecticide resistance, thus providing an opportunity for TCSV to be readily spread if it is introduced to the region. Common blossom thrips has also been confirmed to be an important vector of TCSV. TCSV was first detected in the USA in Florida in 2012, but may have been present a few years earlier and mis-diagnosed as GRSV. 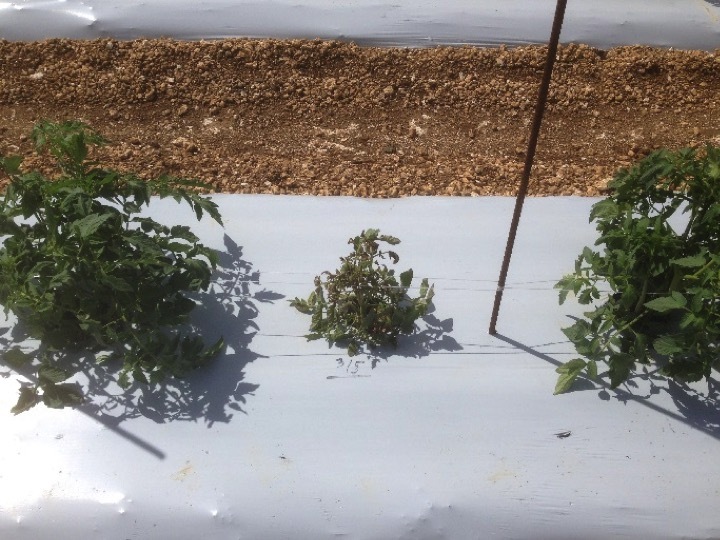 Just two years later it was causing extensive plant loss with symptoms starting to develop only about three weeks after transplanting. 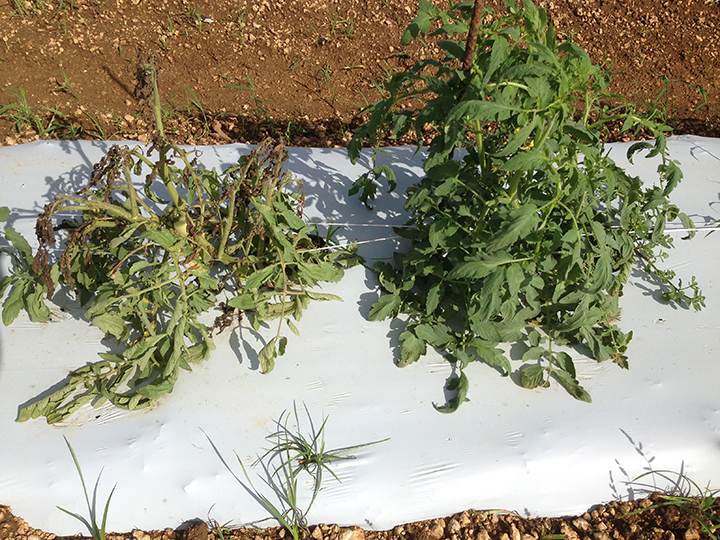 Nearly all plants have been observed affected in a planting. Symptoms. TCSV causes symptoms that are similar to those caused by TSWV. 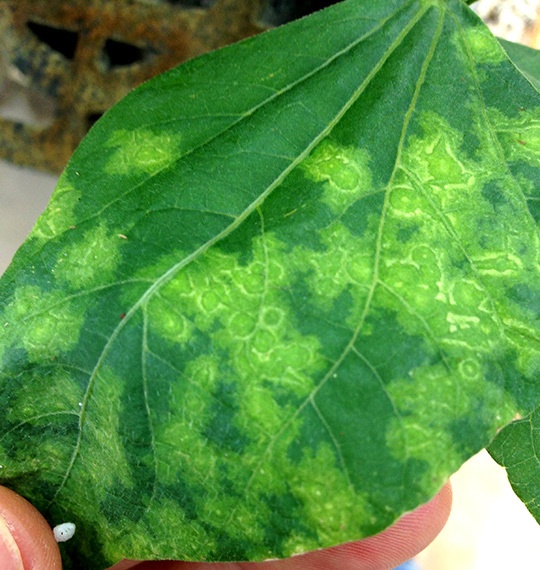 Both viruses cause upper leaves to develop brown (necrotic) tissue often in patterns as is typical with viruses. 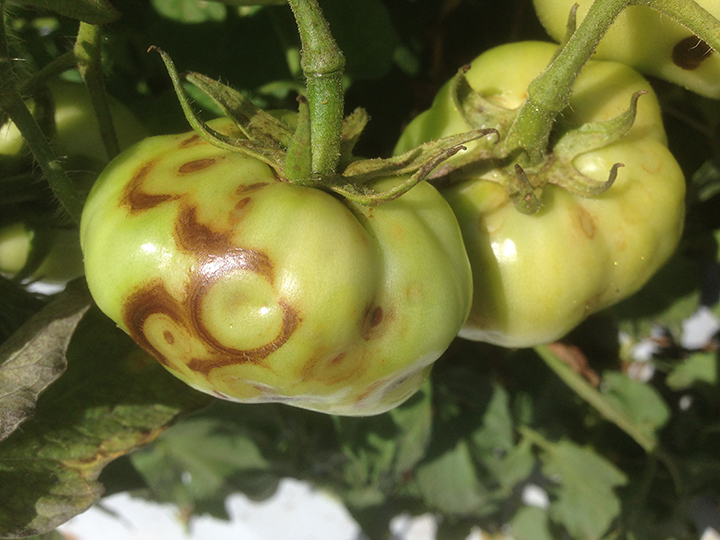 Chlorotic spots and ringspots as well as mosaic also develop sometimes with TCSV. This disease can progress rapidly causing bronzing , wilting, and deformation of leaves, and death of terminal leaves and stems. Necrotic rings develop on fruit rendering them unmarketable. 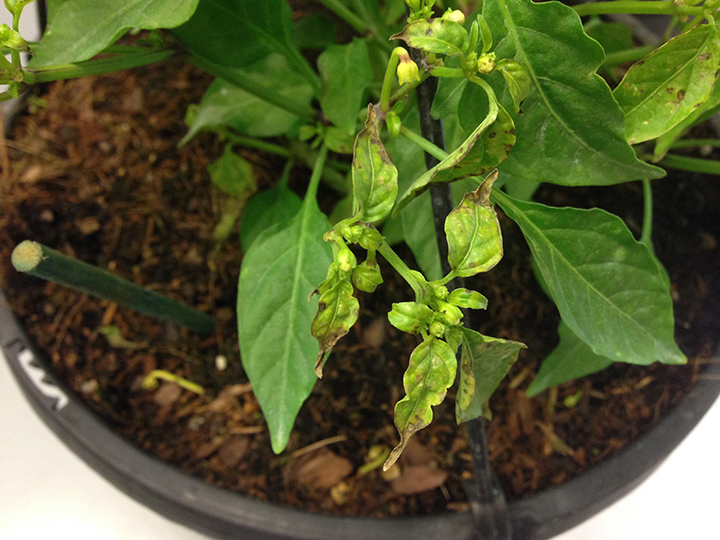 When infection occurs before flowering, plants can be severely stunted and produce few if any flowers, and eventually die. Only fruit developed symptoms during the outbreak in Ohio in 2013. Disease symptoms appear about 3-4 weeks after infection based on time following mechanical inoculation. Long distance movement. 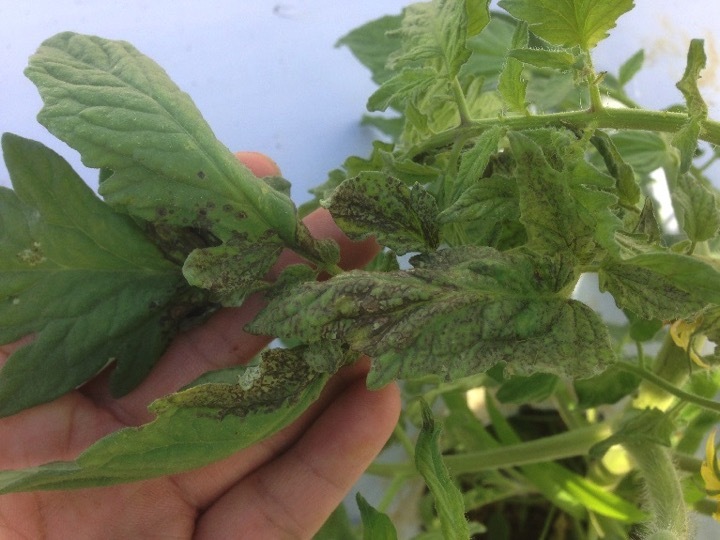 TCSV could be introduced to the northeast in seedlings of tomato or another host plant produced where the virus is already established. Global movement of plants has become commonplace. 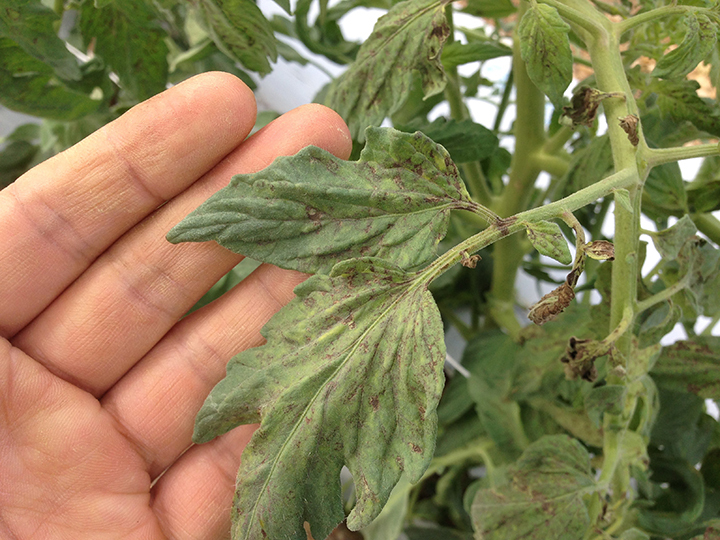 Ornamental plants were also being produced in the high tunnel with affected tomato plants in Ohio, and thrips were numerous. Other Susceptible Plants. 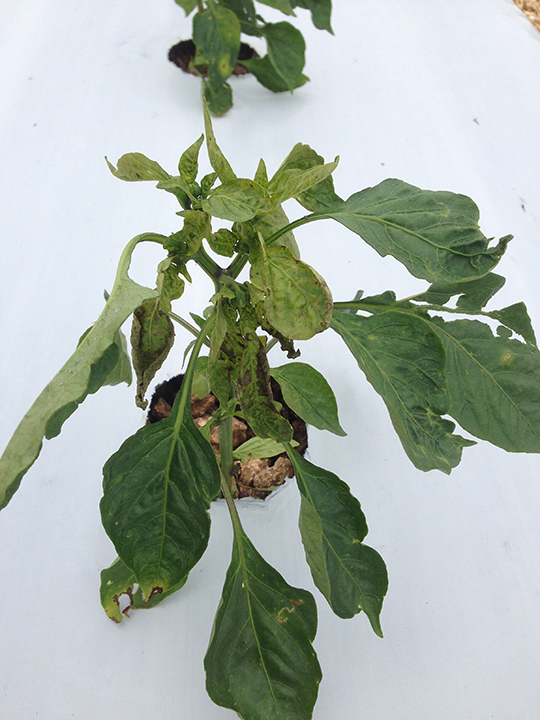 The name suggests TCSV is a disease of tomato; however, when a plant is specified in a virus name it is designating the first host identified for the virus. TCSV has been detected in common (snap) bean, coriander, lettuce, long bean (Vignaun guiculata), peanuts, pepper (bell and chili), several weeds (purslane and Solanaceous weeds in particular jimsonweed), and ornamental plants including impatiens, lisianthus, annual vinca (Catharanthus roseus), hoya (Hoya wayetii), four o’clock (Mirabilis jalapa), and Christmas cactus (Schlumbergera truncate). 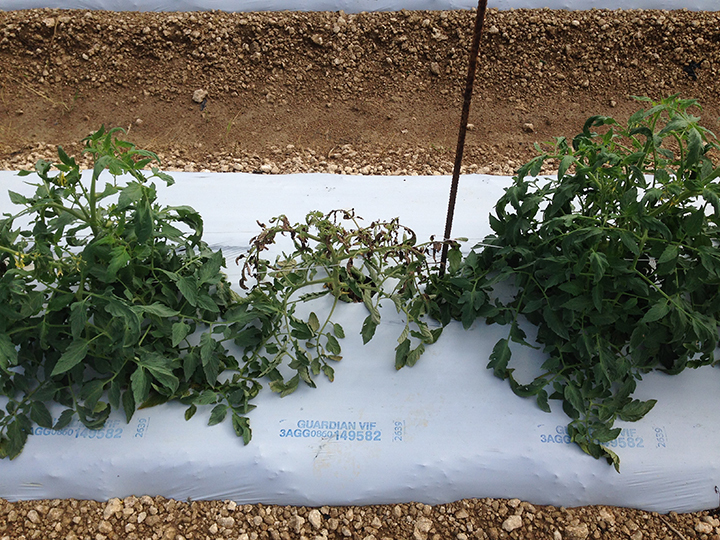 Tomatillo, tobacco, petunia, eggplant, and escarole were found to be susceptible as well when inoculated as part of a host range study. The host range could be wider, similar to TSWV. See Virus Symptoms?? Report It!!. 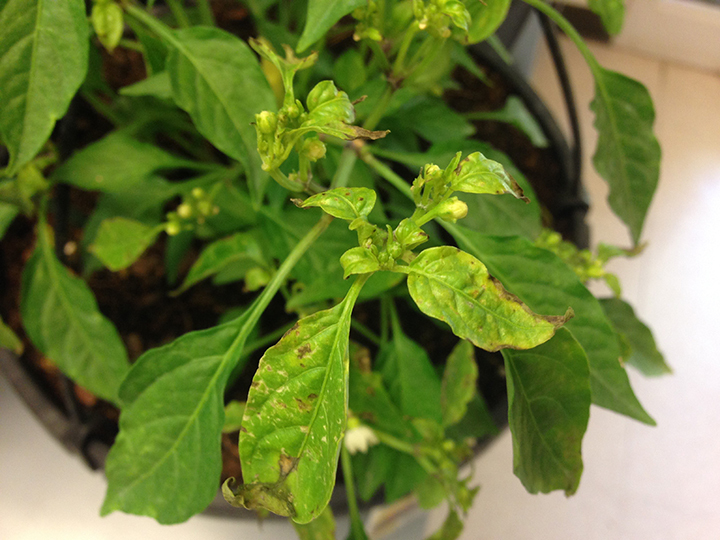 If you see symptoms that could be TCSV or TSWV, please report to Meg at mtm3@cornell.edu or 631-727-3595 or to your local extension specialist. There is funding for testing samples as part of a project underway through 2018. Knowledge about occurrence of a new virus is critically important for management, thus testing is an important component of the project. Management. Plant viruses can be difficult to manage because insect vectors often transmit viruses quickly, limiting the usefulness of insecticides. Focus is on avoiding the virus, thus the current emphasis on monitoring to obtain understanding of TCSV occurrence. Where Did TCSV Come From? New tospoviruses can be created when a plant is infected by more than one tospovirus as a result of these viruses being able to exchange segments of their genome (reassortment). There are eight species recognized presently. TCSV was detected in Brazil and Argentina before Florida. 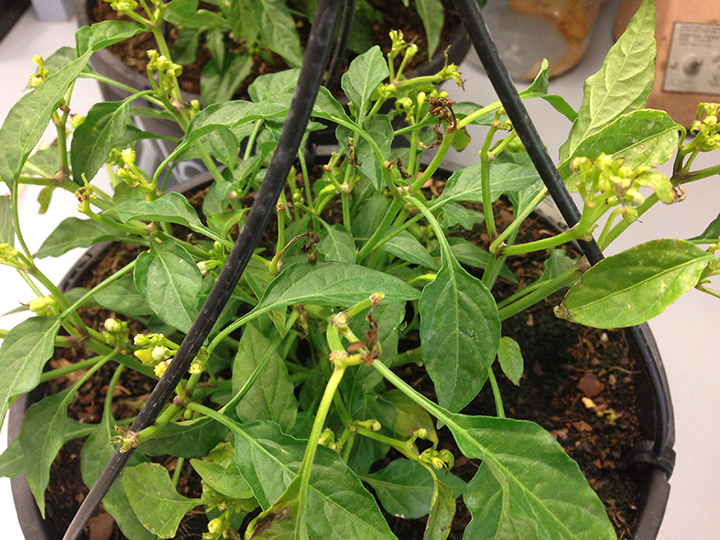 Following photographs are of ornamental and bell pepper plants that became infected naturally (not inoculated) in a commercial planting. 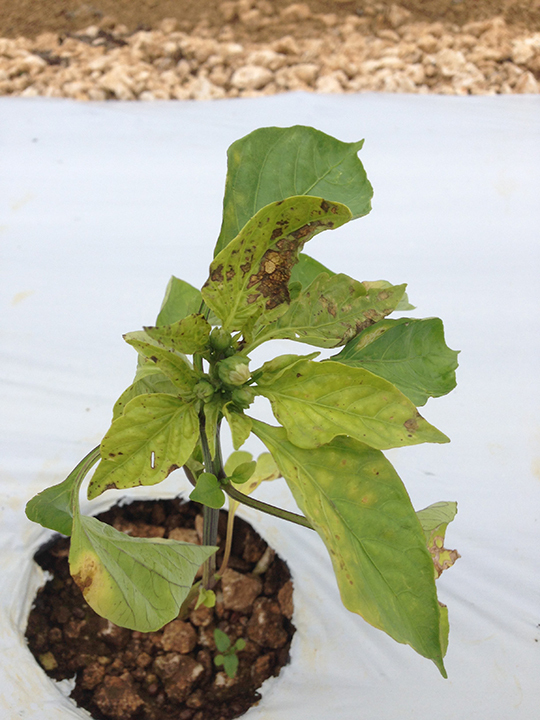 Yellow leaf spots, some with rings, in the following images resulted from natural infection of common bean 'Pony Express' in a research greenhouse in Florida. 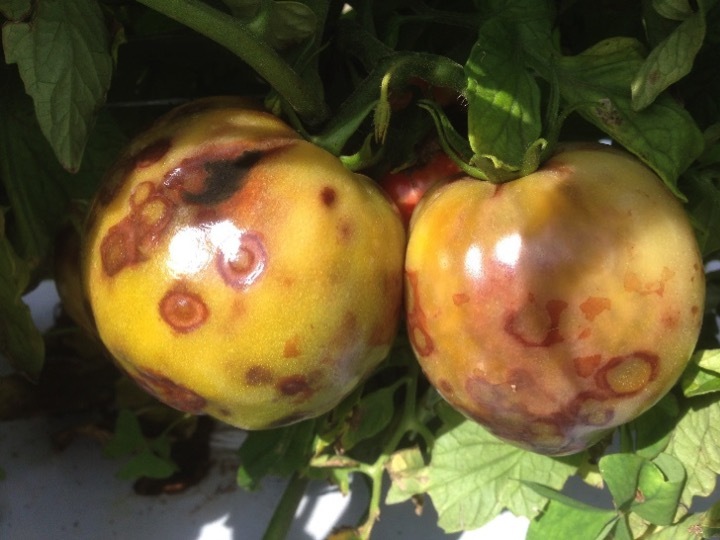 http://edis.ifas.ufl.edu/pp306 Tomato Chlorotic Spot Virus By Jane E. Polston, Erin Wood, Aaron J. Palmateer, and Shouan Zhang. PP306. IFAS Extension, University of Florida.